Lasagna Recipe From Scratch recipe by maham at PakiRecipes.com. Heat oil in a frying pan and fry garlic and onion until golden. Add minced meat and cook for five minutes. Add remaining ingredients except for basil leave and cook for few more minutes. Add basil leaves and remove from flame. For tomato sauce, Heat oil in a frying pan and fry garlic until golden. Add ingredients for tomato sauce and bring to boil. Add basil leaves in the end and remove from flame. Tomato sauce is ready. For white sauce, heat butter in a saucepan. Add refined flour and cook for 2-3 minutes. Add milk and allow to thicken. Add salt , black pepper and cheese. Mix well. Grease dish with butter. 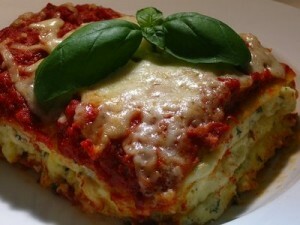 layer with tomato sauce, white sauce, minced meat and lasagna sheets. Repeat the process. Sprinkle cheese on top and bake in pre-heated oven on 350 degrees for 30-40 minutes. Delicious Lasagna is ready. Serve hot!! !